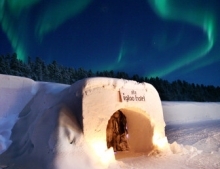 Combine a cool stay in the magical Igloo Hotel, with two nights in a picturesque riverside fishing lodge, an exhilarating dog full day sled and the chance to see the Aurora Borealis in the night sky. Enjoy a flexible holiday combining the Arctic city of Tromso with one of Norway's ice hotels in Alta or Kirkenes. Choose from a wide range of winter adventures to tailor your trip.